Soil Sciences Dept., Fac. Of Agriculture, Cairo University, Giza, Egypt. AFIELD experiment was performed in the sandy soil at El-Sadat City, Menoufiea Governorate, Egypt, for two consuctive seasons (2013 and 2014) to investigate the effect of different sources and rates of phosphorus fertilizers on yield and tuber quality of potato (Solanum tuberosum L.) Cv. Diamante grown on sandy soil. The experiment was conducted under drip irrigation system in split design with three replicates. Four sources of phosphorus were used: phosphoric acid (H3PO4), mono ammonium phosphate (MAP), ammonium poly phosphate (APP) and urea phosphate (UP) with three rates, 50, 75 and 100 kg P2O5/fed applied through irrigation water.The results showed significant differences among the sources and rates of phosphorus fertilizers on total yield, tuber weight, tuber diameter, specific gravity and starch content of tuber. The data revealed that UP and APP were the best among other sources. Data also showed that yield and quality of tuber increased with increasing phosphorus rates up to 100 kg P2O5/fed. 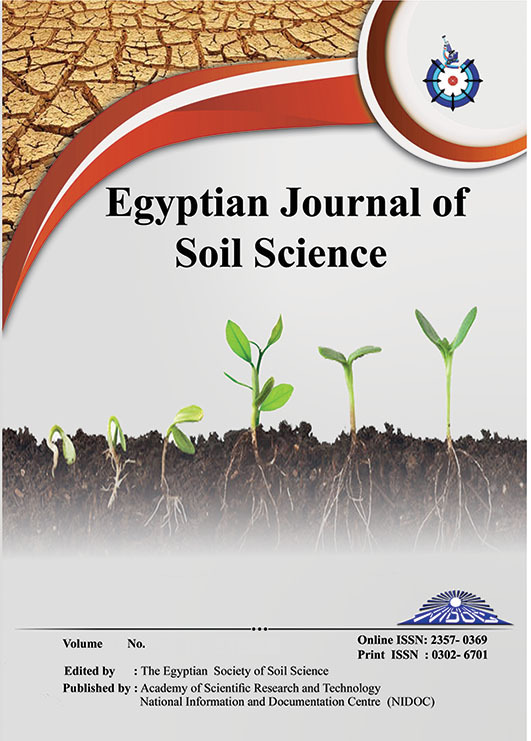 The data also presented that in both seasons, UP gave the highest P concentration in soil compared with other sources of phosphorus.F ield experiment was conducted in sandy soil at El-Sadat city, Menoufiea Governorate, Egypt, for two consuctive seasons (2013 and 2014) to investigate the effect of different sources and rates of phosphorus fertilizers on yield and tuber quality of potato (Solanum tuberosum L.) Cv. Diamante grown on sandy soil. The experiment was conducted under drip irrigation system in split design with three replicates. Four sources of phosphorus were used : (e.i) phosphoric acid (H3PO4), mono ammonium phosphate (MAP), ammonium poly phosphate (APP) and urea phosphate (UP) with three rates, 50, 75 and 100 kg P2O5/fed applied through irrigation water.The results showed a significant differences among the sources and rates of phosphorus fertilizers on total yield, tuber weight, tuber diameter, specific gravity and starch content of tuber. The data revealed that UP and APP were the best among other sources. Data also showed that yield and quality of tuber increased with increasing phosphorus rates up to 100 kg P2O5/fed. The data also presented that in both seasons, UP gave the highest P concentration in soil compared with other sources of phosphorus.